As they age, many dogs get lumps, bumps and masses under their skin. Some of these dog tumors are benign, fatty growths that are completely harmless, but one in four dogs will receive a cancer diagnosis in their lifetime, and cancer is the second leading cause of death in older animals. To learn more about dog tumors, when pet parents should worry and what treatment looks like if dog tumors are cancerous, we sat down with Dr. Barbara Biller, an Associate Professor of Oncology at the Colorado State University Flint Animal Cancer Center and a member of the American Animal Hospital Association Oncology Task Force, who authored the 2016 Oncology Guidelines for Dogs and Cats. A sick dog at the vet. Photography ©Chalabala | Thinkstock. Beyond making sure your dog has regular annual wellness checkups, Dr. Biller mentions looking out for these dog tumor symptoms. If your dog starts to develop skin lumps, or you notice any abnormal swellings or masses growing, bring your pup to the vet ASAP to determine if they are benign (not cancerous) or cancerous growths. Dog tumors aren’t something you can treat at home, so any unusual or new growths should be checked out by professionals. If your dog has a growth, your vet will likely perform a needle aspirate, which Dr. Biler explains doesn’t involve any need for sedation. “The veterinarian takes a needle and pokes that needle into the mass, drawing back some cells in the mass with the syringe that can be looked at on a microscope,” she explains. Your vet will usually order some blood tests and perform a physical examination. If your vet confirms that your dog’s tumor isn’t cancer, that’s really good news! My 15-year-old Chihuahua mix has a benign tumor on his chest, so I know what a relief it is to hear the doctor say that a growth isn’t cancerous. While my vet said the lump was unlikely to become cancerous, it’s still important to keep an eye on it. We were told to monitor the tumor to make sure that it didn’t rapidly change in size, develop any kind of sore and — because the tumor is near his armpit— that it didn’t impact his movement in any way. Of course, you should still bring him in for regular checkups. If your dog’s tumor comes back positive for cancer, your vet will likely recommend surgery, radiation, chemotherapy or a combination of the above. Veterinary medical advancements have also opened the doors to new and better cancer treatments designed specifically for dogs. “In the last couple of years, there are actually chemotherapy drugs that are designed just for dogs. These are dog-only, chemotherapy-type drugs that are potentially more effective for dogs and are less expensive for owners,” Dr. Biller shares. Dr. Biller stresses that treating a cancerous tumor isn’t necessarily expensive. The price of treatment will depend on what you and your veterinarian decide is the best approach for your dog’s specific diagnosis. 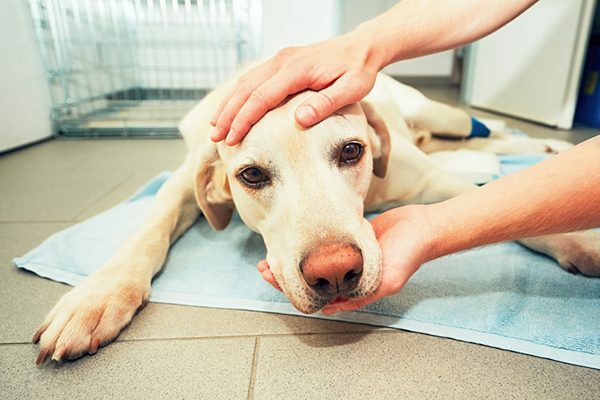 Many veterinarians will work with owners on payment plans, and chemotherapy for dogs can be much cheaper than it is for humans. Dr. Biller estimates that treatment can be as low as $50 a month, or it could range upward of $10,000 for a more complicated course. Dr. Biller also encourages getting health insurance for your dog while he is young and healthy before lumps and bumps develop. Many canine health insurance plans are now covering diagnostics and treatments for any tumors your dog might develop so long as your pup was on the plan before receiving a diagnosis. While cancerous tumor treatment for people and dogs looks very similar, there are some big differences. Just like with humans, many veterinary hospitals are working on clinical trials to develop new and hopefully more effective cancer treatments for dogs. The costs associated with treatments in clinical trials are usually fully covered by the research hospitals. Ask your veterinarian to refer you, or learn more about various clinical trials your dog might be eligible for in the US and Canada by visiting caninecancer.org.au. Thumbnail: Photography ©blanscape | Thinkstock. Ask a Vet: Lumps on Dogs — Do I Need to Worry About a Tumor on My Dog’s Chest? Sassafras Lowreyis an award-winning author. Her novels have been honored by organizations ranging from the Lambda Literary Foundation to the American Library Association. Sassafras is a Certified Trick Dog Trainer, and assists with dog agility classes. Sassafras lives and writes in Brooklyn with her partner, a senior Chihuahua mix, a rescued Shepherd mix and a Newfoundland puppy, along with two bossy cats and a semi-feral kitten. Learn more at sassafraslowrey.com. The post Are All Dog Tumors Cancerous? Here’s What to Know appeared first on Dogster.